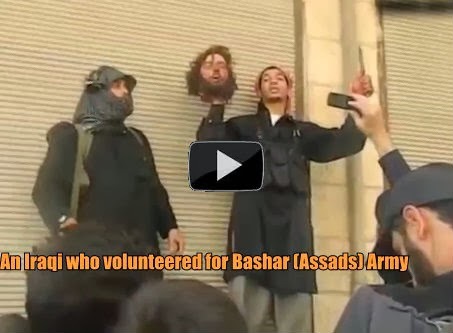 Thugs in the Youtube video are shown in the city of Aleppo holding the decapitated head in front of a crowd of people, some of whom are taking photos and video. A group of Al Qaeda-linked Syrian rebels beheaded a fighter then triumphantly waved his head in the air as a trophy — only to discover the poor guy was actually one of their own, London’s The Telegraph reports. Members of the Islamic State of Iraq and al-Sham are shown in a graphic video (Warning: Graphic images) clutching the head of a bearded victim while claiming he was a hated member of an Iraqi Shia group fighting for President Bashar al-Assad, the paper reports. But the killers soon learned that the victim, Mohammed Fares, was actually an allied fighter for Ahrar al-Sham, a Sunni Islamist group that fights alongside their own group of Al Qaeda-linked thugs. Fares is believed to have been wounded during a battle outside of Aleppo then taken to a hospital by members of the Islamic State of Iraq and al-Sham. He may have been captured and mistaken for a Shia fighter because of his wounds. Assad forces have been fighting to claim the city of Aleppo for the past two weeks. Fares is also shown in a past Youtube video speaking with Syrian rebels.